Its plot doesn’t make a lick of sense, but Topper Returns has something better: delicious slapstick and a cast of comic actors who do 1941 proud. 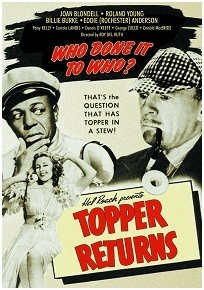 This was the third and final entry in the Topper series, in which our timorous hero (Roland Young) helps a ghost (Joan Blondell) find out who murdered her in an old, dark house. Click here to watch it for free.